Gender Links has just completed a programme to promote gender in local government in Zimbabwe and in the Southern Africa Development Community (SADC) region. Based on the research report, “At the Coalface, Gender in Local Government” undertaken in 2010, the book assesses “Gender @ Work in Local Government” in Zimbabwe following the steps taken since the research to promote gender-responsive service delivery at the local level. Download the executive summary and the At the Coalface Booklet. 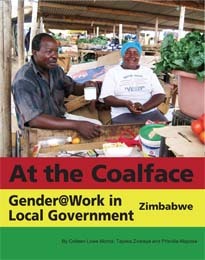 Buy the book, At the CoalFace, Gender@Work in Local Government, Zimbabwe through GL’s shop. 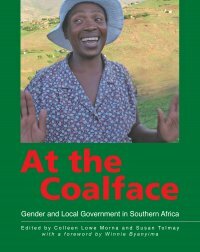 In 2006, as a sequel to Ringing up the changes, GL conducted a groundbreaking new study on gender and local government in Southern Africa called At the Coalface: Gender and Local Government in Southern Africa. The initial study took place in four countries (Lesotho, Mauritius, Namibia and South Africa), followed in the second phase by Botswana, Madagascar, Mozambique, Swaziland, Zambia and Zimbabwe. GL produced a DVD which draws on examples and cases studies from Botswana, Lesotho, Madagascar, Namibia, South Africa and Swaziland to demonstrate the impact of different electoral system and the use of quotas on increasing women’s representation in decision making positions. View the DVD.